A senior Russian lawmaker claims that the United States clearly intends to bolster its military presence in Ukraine, which will cause Russia to retaliate and reinforce its borders as a response. 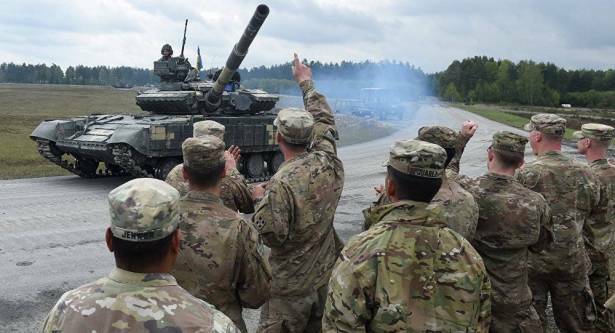 The United States clearly intends to bolster its military presence in Ukraine, which will cause Russia to retaliate and reinforce its borders as a response, a senior Russian lawmaker told Sputnik Thursday. Earlier in the day, US Defense Secretary James Mattis, during his Kiev visit, said that Washington planned to strengthen its relations with Ukraine at the strategic level in order to ensure peace and stability. The defense secretary added that Washington had recently approved deliveries of various technology worth $175 million, including special equipment that would boost Ukraine's defense capabilities. "It is clear that everything seems to indicate that the United States will increase its military presence in Ukraine. We are going to take retaliatory measures and reinforce our borders as these developments happen close to our territory," Igor Morozov said. According to the lawmaker, this reinforcement might be analogous to last year's deployment of two inter-service and one tank divisions in Russia's Western Military District and of Iskander missile systems in the Kaliningrad exclave bordering Poland and Lithuania. "That was a response to the deployment of the US missile defense in Romania. In this case it is also necessary to react," Morozov stated. The lawmaker went on to point out that, according to the statements made by the US officials, the country was not actually interested in resolving the Ukrainian crisis. "Such absurd statements, attributing responsibility for the implementation of the Minsk agreements, have been made by Washington so far. This suggests that [the United States] is still trying to use this issue in order to put pressure on Russia and on President Vladimir Putin," Morozov emphasized. Russia has repeatedly stated that the delivery of weapons to Ukraine would not contribute to the settlement of the Ukrainian crisis, nor to the implementation of the Minsk agreements. Moscow has further noted that supplying munitions might be perceived by Kiev as encouragement to continue military action.